OK, clearly I am going through some kind of pancakes obsession. I do that… lock into certain foods, want to eat them for ages, and then completely go off them and don’t want them near me for weeks. Fickle. Anyway, now I am on Atkins Induction I perfected my Atkins pancake recipe… it is so good. It is very different from the protein pancakes – those are sweet and really like a dessert. These are savoury, much like a slightly less fluffy wholemeal buttermilk pancake. Blend, and fry. 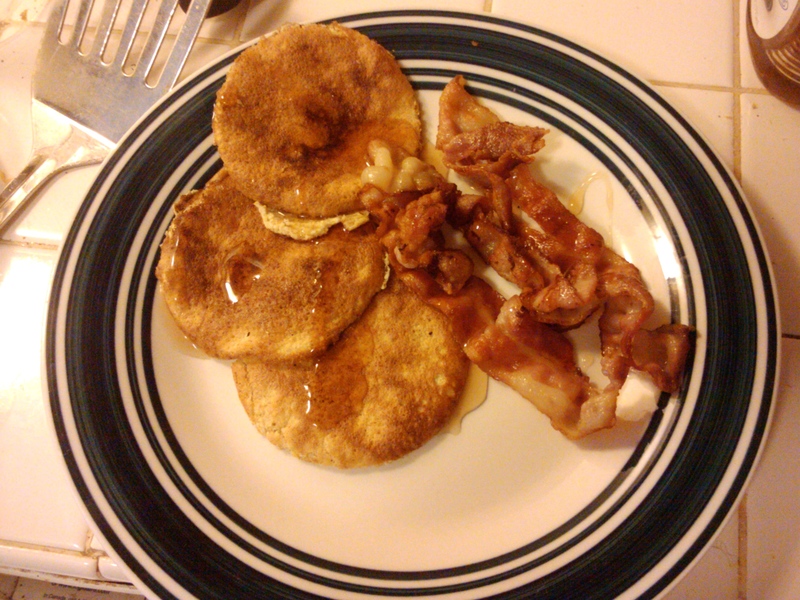 Serve with your usual breakfast fixings, here bacon and a splash of sugar free syrup. For extra brownie points, fry them in leftover bacon grease (thanks Clio for the tip). NB: I cut these out of one large pancake using a glass rim. I found the mixture a little too runny to make individual ones. I know y’all hate Atkins, but I don’t think these are too unhealthy; the fat is mostly omega 3 and there is lots of fiber (so watch out if you eat them too often – don’t forget to drink water 😉 ). Nutrition (pancakes only): calories: 159; Fat: 11.32g; protein: 10.6g; carbs: 5.55g; fiber: 4.3g (net carbs: 1.2). This entry was posted in Atkins, Low carb, Pre-wedding (Atkins), Recipes on March 22, 2011 by Me.